Greek olive trees (Olea europaea) grow best in places where summers are long and hot and there are cool, lightly subfreezing temperatures in winter. In the United States, olive trees grow best in southern California, low deserts of southern Arizona and in the highlands of Hawaii. Arkansas's climate poses many challenges to growing olive trees; don't expect reliable flowering and fruit set if any survive. Arkansas is in U.S. Department of Agriculture hardiness zones 6, 7 and 8 where winters drop to temperatures between minus 10 to plus 20 degrees Fahrenheit; olive trees are hardy to no colder than zone 8. In Arkansas, winters drop to temperatures between minus 10 to plus 20 degrees Fahrenheit annually, while summers are long, hot and humid. Northern and central Arkansas is listed as USDA zones 6 and 7, which is too cold to grow olive trees without significant branch die-back from the cold temperatures in winter. Using Sunset climate zone ratings, Arkansas rates as zones 33 and 35. According to "Sunset National Gardening Book," olive trees grow best only in climate zones 8, 9 and 11 through 24, and in Hawaii. Olive trees need a fertile, well-drained soil with full sun exposure to prosper, but they are drought tolerant and can grow successfully in shallow, infertile soils that are gravelly. They survive temperatures down to 15 degrees Fahrenheit. Horticulturists at Texas A&M University note that these trees lose leaves and small stems at 17 degrees Fahrenheit and more severe plant damage occurs at 12 degrees Fahrenheit. When below 10 degrees Fahrenheit, all above-ground parts of olive trees are killed; however, mature trees can regrow from underground parts following a severe freeze. 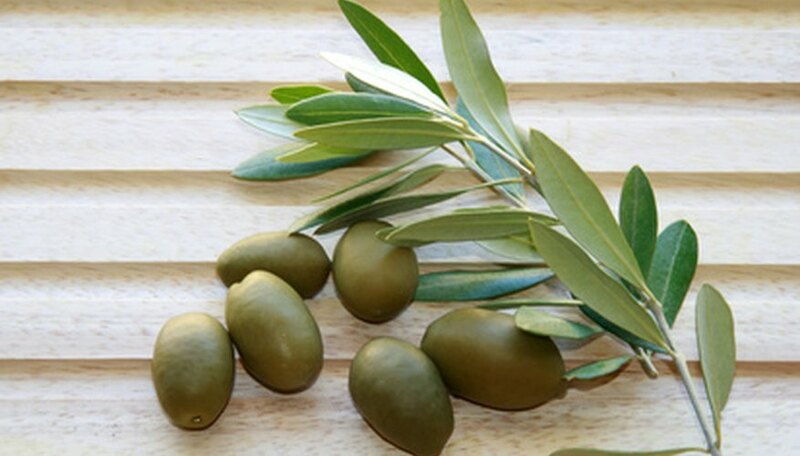 No literature from Arkansas Cooperative Extension or the University of Arkansas addresses growing olive trees in home garden or in commercial settings. Texas A&M University notes that winter cold is the limiting factor for growing olives in Texas and elsewhere, including the neighboring state of Arkansas. While olive trees grow in southeastern Texas, they are frequently killed back in winter from various bouts of cold weather. This would likely hold true in Arkansas, with perhaps the best growing areas being only in extreme southern Arkansas that is rated USDA zone 8. Olive trees are subtropical Mediterranean fruit trees that need a cool winter period to flower in spring and subsequently form fruits. While the cool temperatures in Arkansas are adequate enough to meet this cool threshold and exposure known as vernalization, winters that are too warm prevent flowering. Thus, overwintering olive trees indoors in a heated location precludes fruit production. According to Texas A&M University, olive trees are potentially grown as rejuvenating evergreen shrubs in northern Texas and Hill County, which are nearest the climate of Arkansas. In southernmost Arkansas, where winter temperatures do not drop below 15 degrees Fahrenheit, an olive tree may prove a worthwhile plant to try to grow. If winter cold kills back branches and the plant continually must regrow itself, flowering and fruiting likely will not occur or be sporadic at best. Since olive trees are slow growing, planting the tree in a large container in Arkansas and overwintering it indoors in a brightly lit but cool outdoor facility may be the only way for fruiting success. Once spring arrives, the tree can be relocated outdoors in full sun again and allowed to flower and potentially set fruit across the long Arkansas summer. Excessive summer humidity and rainfall may still pose problems in Arkansas. Where Are Peaches Grown in Georgia? Approximately How Long Can an Olive Tree Live? What Kind of Climate Does a Pomegranate Tree Need? Do Almonds Trees Do Well Where There Are Cold Winters?